Over the last 20 years of Shillington history we’ve seen some fantastic graduate success stories, from those securing design roles, to going freelance and setting up their own businesses. The latter is exactly what Manchester graduate Kladi Vergine did by setting up Printmysoul—a multi-faceted design company offering a variety of services. Alongside her client work, Kladi has been gaining attention for her self initiated project ‘Plant Therapy’. Nominated for the Fedrigoni Top Award 2019 and picked up by local bookshops in Leeds and Manchester. Read on to hear more about Kladi’s achievements with Printmysoul and Plant Therapy as well as her Shillington experience and advice to fellow graduates. You studied on our full-time course back in 2010 in Manchester, did you enjoy your time on the course and can you share with us any key moments from that time? I came to Shillington to achieve a career change as my degree was in a different background—I used to work in PR in Milan and Sydney and I couldn’t have made a better choice than attending Shillington. My experience was amazing! I wish I could go back in time to those months spent in the campus all over again. The practical approach, the fast pace of work, the vital key Adobe software lessons and shortcuts, the number of briefs and the amazing staff—it was all a great and fun way to learn about my dream job. I would re-take it anytime! I had the luck to work alongside some amazing lecturers Orla McGrath, Sarah McHugh and John Fry. I remember waking up earlier than what I usually did, excited to attend a new day at Shillington. Studying at Shillington, due to the contained number of students per session, gave a real studio feel from the very first day and I remember how great it was to build relationship during team work based on each other strengths and working together during brainstorming. I also enjoyed going out after class alongside our lecturers that invited us to attend many local design related events with them. Since graduating you’ve decided to go down the entrepreneurial route launching ‘PrintMySoul’ a Design Service Studio offering multiple services as well as selling your own products. Can you tell us a bit about how you went about setting this up? Printmysoul brand concept was born on a Shillington desk during portfolio building session towards the end of the full-time print design course. In fact the brand name, initial drafts of the logo and studio concept are the result of branding myself in both my first full time course took in Manchester 2010-11 and then when I was attending the web course in 2013 at Shillington’s London campus and built the first version of my studio site. After graduating I completed an internship at Creative Spark in Manchester and was offered a job as a design executive at Printing.com. I was very excited to work with a printer, especially being next door to the big litho presses. Attending lots of Manchester design events while studying gave me the chance to meet many amazing and inspiring creatives such as Tash Willcocks, Dave Sedgwick and Si Scott which gave me a great inspiration in keeping my personal project running alongside my official design job. I kept developing side projects which led to my first big clients, making it possible for me to quit my job, rent a studio in the M-ONE working space alongside to some of the amazing people I’d met as a student and pursue the career as an independent designer by running Studio Printmysoul. Your recent publication ‘Plant Therapy’ is a beautifully illustrated book all about how to create the perfect indoor environment for plants. Can you share with us your design process regarding the creation of the book and what inspired you to make it? Plant Therapy is the result of pursuing and focusing on my dearest passions: design, plants and paper. It is also an example of how it’s possible to transform disappointment in success. I am an avid plant collector and my home is a ‘jungalow’, so the topic is truly something that is part of my daily life. The care and determination used to grow and make plants survive, as I share in Plant Therapy, is very similar to how I develop and curate a design project. Observe, learn about the subject and find the correct solution, within existent limitations, to create a noticeable difference and bring beauty to life. While I was already planning a promotional set to introduce the Studio to new clients and larger marketing companies, a book brief I was already working on got canceled half way and the client disappeared. I was very disappointed at first but then I suddenly saw the opportunity to use all the research done for the book. I decided to develop a bespoke Printmysoul book which would differentiate the studio promotional from the usual stationary or brochure. I have followed the advice I often give to my clients: focus on what they do with love without being afraid to be bold and to invest in memorable, long lasting and unusual items or formats that will be kept and will last longer than any business card. 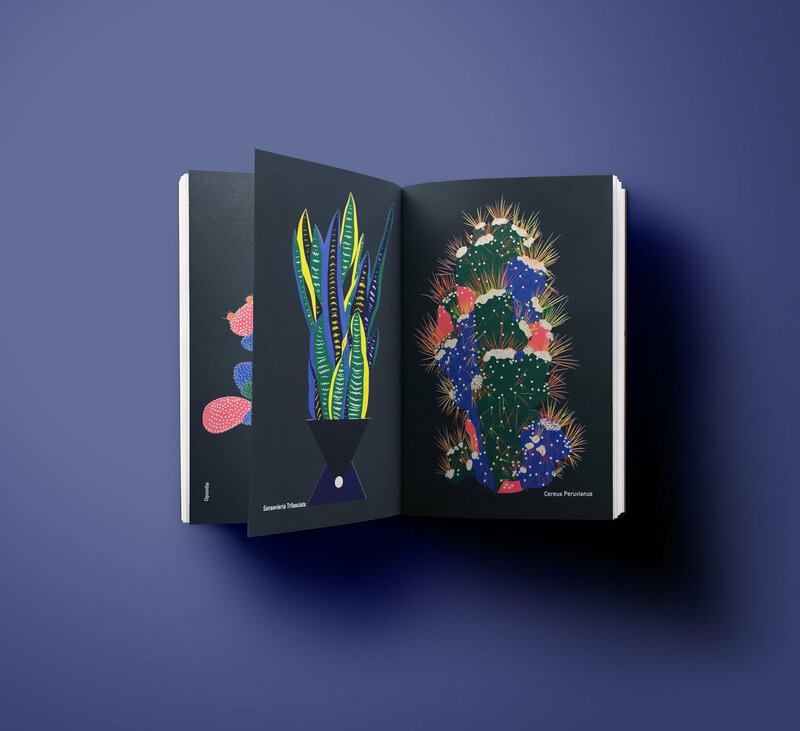 I have found huge support in Fedrigoni UK which provided me with great quality paper made in Italy and fully embraced the project which is now entered in the TOP 2019 Fedrigoni Award. Do you think your time at Shillington gave you the skills and confidence to begin your own design studio? At Shillington I have found that both staff and college support their students greatly before and after graduation. The studio atmosphere recreated in college, the focus on the different aspects of a brief the exposure to high quality design output project your aspiration to a very high standard of work ethics you will find hard to compromise afterwards. This is another reason why Shillington helped me with going independent. Once you learn how to express your vision with your artwork it affords you the freedom to go freelance. That’s the whole concept of print-my-soul. To “make an impression” on the market. Of course you will need a lot of passion and dedication to make sure you keep going no matter what. Remembering my happy time as Shillington has always energised my darkest moments. That’s why I went back for the web course and I would love to go back any time to be soaked in the powerful and beautiful energy of the college. The skill set you come out of Shillington with will make you feel like a superstar compared to other graduates as the experience and confidence gained by working everyday with industry experts is invaluable. PrintMySoul has had numerous impressive clients across a broad spectrum of services, which has been your favourite project to date and why? Working with a broad variety of industries is what I really love about running an independent studio. One day I can be visiting a furniture manufacturer, the day after be in theatre to see my client performing. Or it could be receiving some unreleased music for an album cover and hours later discussing textures for kids clothing or tasting some new secret gin recipe for an upcoming liqueur brand. Each project comes with many exciting moments, as well as challenges, and each experience brings new lessons. I have worked with talented artists as Mica Townsend, lead singer of the West End musical production Thriller Live and produced a mural sponsored by Absolut Vodka. However one of the most memorable jobs to date is a local successful restaurant re-branding with full print and web design consultancy. 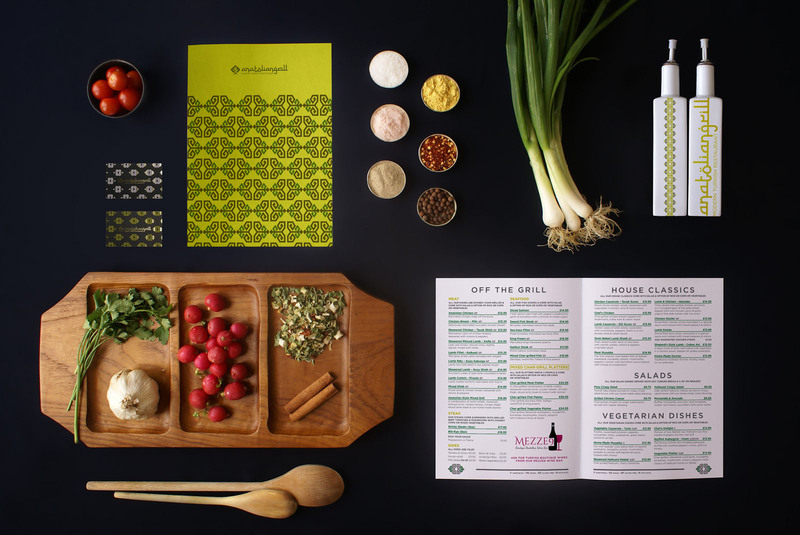 I have been working with Anatolian Grill, for more then a year now developing their new logo, full set of menus, laser-cut wood boards, interior accessories, website and promotional. It is very satisfying to see your vision coming to life an it is a pleasure to work with clients who enjoy design and have a keen eye for details like Anatolian Grill’s owner Mr. Selvi. Last year we launched our Shillumni Network as an effort to bring our graduates closer together. For a graduate from more than 5 years ago what does this mean to you? It was great news to see Shillington making the effort to build a community of creatives. Shillington is such a unique experience and the Shillumni network is a great way to be linked to new staff and with the other students, now active professionals. I often think how great will it be to go back and take the course all over again. I’ve enjoyed taking part in some of the Shillumni workshops like the Sketch taster in Manchester and I found it very exciting to be back in the classroom. It’s also very interesting to meet with other fellow Shillumni and see where their careers have taken them. I would definitely be interested in being involved in Shillington alumni activities as I find the Shillington approach very unique in the way the teaching is knitted with the local creative industry, community and of course the real designer-led, hands-on practice. Finally, do you have any advice for other graduates hoping to launch their own business? I always advise to make sure you pursue experiences in other studios or companies before starting your own creative practice and to be prepared to keep your chin up despite the ups and downs of the job. Mostly do not take personally any negative comment and make sure you follow the good practice learned while a Shillington. It is also vital to integrate design in your lifestyle, do travel to see exhibitions and make sure you keep up to date with colleagues work and celebrate any visual you find appealing. My personal archive of inspiration started at Shillington is never ending! I have had few recent graduates that have seen my book and contacted me to visit the Studio in Manchester and request advices, my door is always open for portfolios reviews, tips and feedbacks. Get connected, work hard and be patient in order to build a successful career. Huge thanks to Kladi for sharing her story with us. Remember to check out the full extent of the work she’s been doing with Printmysoul and of course the wonderful Plant Therapy book. Get regular updates on Instagram, Twitter and Facebook. Keen to up-skill and start your own business? 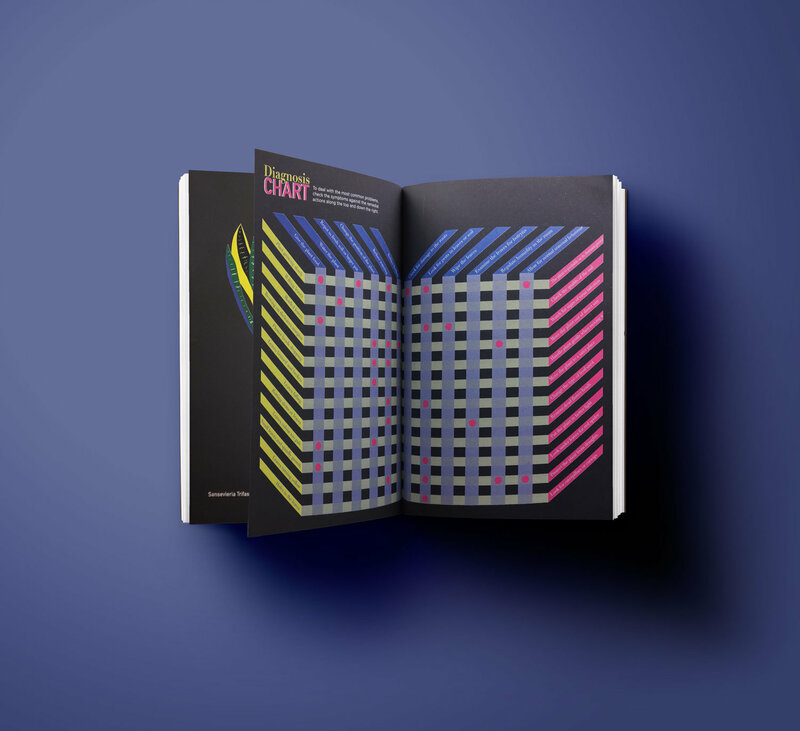 Find out more about studying graphic design at Shillington on our website. Or attend one of our Info Sessions to see a live presentation and meet our staff and graduates.